Sola Adeyemi lectures in theatre and performance at Goldsmiths, University of London. 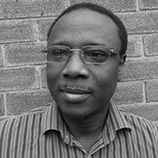 His research interests include world theatre/s and performance studies, specifically the works of the Nigerian playwright Femi Osofisan; intercultural performance cultures; avant-garde performance; contemporary British theatre; postcolonial literature and African Studies; and diasporic African and black British theatre in its exploration of the politics of identity on the British stage. He has recently completed a book on Femi Osofisan, ‘Vision of Change in African Drama: Deconstructing Identity and Reconfiguring History’. He is Associate Editor of the African Performance Review, and Contributing Editor of 3P+ International Journal of the Arts. Sola is the General Secretary of the African Theatre Association (AfTA), UK, an international non-profit society open to scholars and practitioners of African performance and theatre.